Situated between the Burj Al Arab and the Jumeirah Beach Hotel, Wild Wadi Water Park is Dubai’s Arabian-themed water park. Spread over 12 acres, the resort features 30 rides and attractions. Most are interconnected, allowing riders to move from one to the other without ever leaving the water. In addition to all the rides, the Wild Wadi Water Park offers numerous restaurants and shops. The park operates a cashless wristband payment system. The Mall (0.2 miles) - Shopping mall opposite the Jumeirah Beach Hotel. Naya (0.3 miles) - Restaurant at the Jumeirah Beach Hotel offering classic and contemporary Indian cuisine. Colourful, circular indoor dining area. Family-friendly. Terrace offers a wonderful view of the Burj Al Arab. Scape (0.3 miles) - Casual poolside restaurant at the Burj Al Arab. Offers a California-inspired menu. Shimmers (0.4 miles) - Restaurant on the private beach at Jumeirah Mina A’Salam, Madinat Jumeirah. Offers a Greek/Mediterranean menu. Stunning views of the Persian Gulf and Burj Al Arab. The Hide (0.6 miles) - Lounge and fine dining steakhouse at Jumeirah Al Qasr, Madinat Jumeriah. Offers Angus and Wagyu steaks. Fantastic freshly baked bread. Pai Thai (0.7 miles) - Thai restaurant at Al Qasr, Madinat Jumeirah. Spectacular view over the waterway of the Madinat Jumeirah. Arrive by abra. Map showing location of Wild Wadi Water Park. I love Wild Wadi so much. It rocks. I go all year even in the school weekends. I can’t wait to go this Friday. I never get bored. Whoever made Wild Wadi is awesome! When I went to Wild Wadi I had the best time of my life. My favourite ride was Thunder Rapids. A fantastic experience. I can’t wait for my next holiday so I can enjoy myself again! I loved everything about it . I agree with Amelia, especially Marco! He made the holiday! WILD WADI IS AMAZING! The lifeguards are lovely and very good looking. I must say, its great fun and I don’t agree with the bad comments. I loved it. Wild Wadi was incredibly overpriced for the type of rides it provides. The rides were slow and very disappointing. There was nothing wild about any of them, even the Jumeirah Sceirah didn’t bring much excitement. If you are looking for thrills and an adrenaline rush this is not the place to find it. Great for people holidaying with small children. My family and I had a fabulous time at Wild Wadi. We forgot the world outside existed. It is simply amazing. As mentioned in one of the contributions, we could get the wrist bands loaded with cash. I wish someone had told us this at the reception. We were famished and none of us wanted to go back to get cash. It is a superb idea. I hope to enjoy more next time. It’s great and the time runs very quickly once you enter the water. My family and I have spent the last 3 years at the Wild Wadi. It’s awesome, and quite surreal with the Burj Dubai as a back drop! It has so many life guards you will feel completely safe to let your children explore by themselves. The only downside is it’s getting a bit tired now and a bit smelly. It’s great! I’ve been there and I liked it so much. It’s wet! It’s wild ! 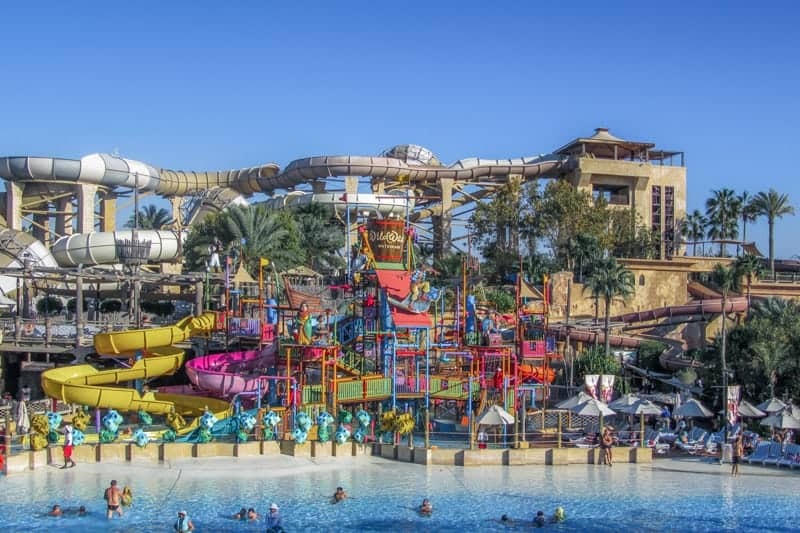 It’s Wild Wild Wadi – the wildest waterpark ever! Wild Wadi, what can I say? Wonderful. wild wadi is a place like no other. you will never get bored like some other water parks. it is loads of fun and the people that work they are really friendly and so are the people that go there to have a good time. you won’t regret it. something you will always remember. This place is so amazing. If I could I would move to Dubai just to enjoy this amazing theme park. I loved wild wadi. Don’t worry about any dress code. Bikinis and tankinis are fine. If you are wearing a bikini be careful you don’t lose it on the Jumeirah Sceirah. There’s lots of sunbeds where you can relax between rides. The wristbands are a great idea. You can load them with cash and buy drinks etc without carrying any money around with you. If there’s any credit left at the end of the day they give you cash back. Large waterpark at Atlantis, Palm Jumeirah.